Social media is the new word of mouth. It is an online networking forum where you encounter existing and potential new customers every day. Unlike traditional networking groups, however, you don’t have to drive across town or pay some silly breakfast fee to attend an event. You can manage social media from your cell phone and you can talk to anyone in the world. You don’t have to wait politely to get a word in edgewise or intercept someone at the door before they leave the event. You simply have to state your value and let today’s digital media save you time, save you gas, and do the legwork for you. You have only to look at a news feed to see how many articles and ads are already scrolling through the palm of your hand. Consider everything you see, and realize that it makes an impression on you on some level every time you browse the listings. Now ask yourself this question. How many potential customers are checking their social media news feeds as you read this? What would it look like if they began to see your articles, videos, and ads on a regular basis? What could this do for your sales team, and what could this do for the overall revenue you generate annually? Don’t miss out on the most powerful networking tool in the history of business. Put your message in the palm of your customers’ hands so they will remember your brand and very quickly come to recognize it. Provide them with daily updates on what your company offers. Offer case studies detailing your previous accomplishments. Promote specials and future ventures. Our social media experts will share your ads, commercials, and articles to your audience. The videos and ads we create for you, combined with the articles that we write for you, will make your social network come alive with activity, bringing new followers into your network daily. Through daily social media management, we will also increase your number of followers. The more people actively follow you, the more attention you capture in the market. The more activity you have in social media, the less you will have to depend on search engines. As we develop a following for your business, more people will inquire directly through social media as to what you can do for them. Social media also builds links back to your websites. If you want to maintain a high position and search engine rankings, social media syndication lets the search engines know just how important your website actually is. The more people who come back to your website through social channels, the more your website stands out as an authoritative source of information on topics that pertain to your industry. To be known as an expert in your field– and also an expert who can be trusted– is the best way to recession-proof your business and to ensure continued longevity and prosperity for your company..
People always turn to experts regardless of whether times are good or bad. 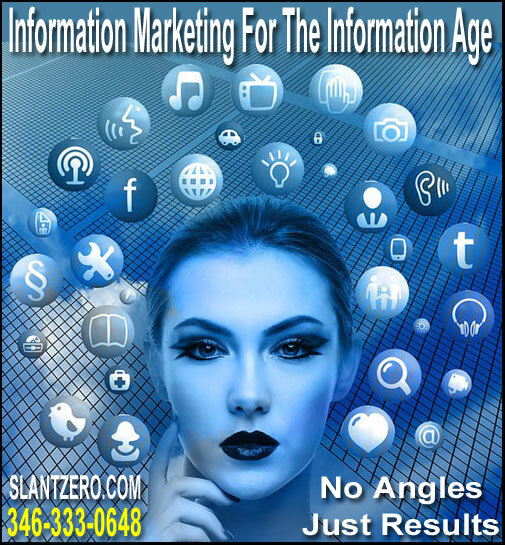 Slant Zero will keep you in the social media Loop so you don’t miss any opportunity to position your brand and clearly state what you bring to the table. The articles we publish with your ads clearly present the unique advantages of your product or service. Your social network becomes a distribution center, sending this information out into the marketplace where your brand will be seen and your competitive advantages clearly understood. While it’s common practice for people to include photographs and artwork in posts when they publish thoughts on Facebook or Twitter or LinkedIn, not many people think to use advertisements to create not only a visual presence but to send a message as well. 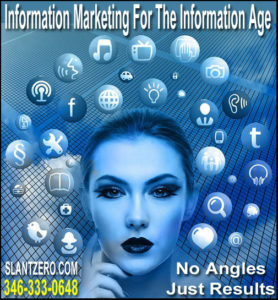 Over time, this wealth of information allows us to do something else that is vital to the success of your campaign. It allows us to increase the number of followers who actively engage your site. By providing rich, informative, and relevant information on a daily basis, we attract feedback and commentary from people who eventually develop into fully qualified leads. This often results in clients asking us to take over their social media management. When we do so, social media becomes much more than a distribution center of media. It becomes a forum of active community engagement where we can personally message prospects and existing customers and put them in direct contact with your sales team.